A total of 41 projects were signed at the opening of the 2019 Zhongshan Trade and Investment Fair& Top Talent Networking event on Thursday, further fueling the rapid growth of the southern Chinese city. These projects fall into four major categories defined by the local government, including strategic cooperation, industries, public service platforms, and platforms for professionals and research, as well as education, according to the organizing committee. Twelve out of the 41 projects are valued at more than 1 billion yuan ($148.4 million) each, according to official data. Following an incubation center for youths from Macao established last year, one of the projects provides an innovation and entrepreneurship base for budding entrepreneurs from Hong Kong. The Zhongshan government encourages these kinds of exchanges by providing financial and housing support to young people from Hong Kong and Macao, who bring their innovative startup programs to the city. Tan Jiubin, an academician of the Chinese Academy of Engineering and a professor at the Harbin Institute of Technology, will lead a team to build an industrialization base in Zhongshan to mass produce his latest equipment inventions. It is expected to help localize advanced equipment and build Chinese brands that can serve both the smart manufacturing and biomedicine industries in the city, according to the organizing committee. Opple, a leading lighting manufacturer based in Shanghai, will invest 2.58 billion yuan to build its South China headquarters in Zhongshan for research and development, manufacturing, sales and settlement of smart home products. The company will take up an area of 300,000 square meters and is expected to pay 225 million yuan in taxes annually, the organizing committee said. China Resources Gas Group, a subsidiary of China Resources (Holdings), one of the largest State-owned conglomerates based in Hong Kong, will build its center for the Guangdong-Hong Kong-Macao Greater Bay Area in Zhongshan. The center will be engaged in research, manufacturing, sales and big data for gas, solar energy, green household appliances and purifiers. It is expected to generate 1.5 billion yuan in annual sales and contribute 100 billion yuan in taxes, according to the organizing committee. 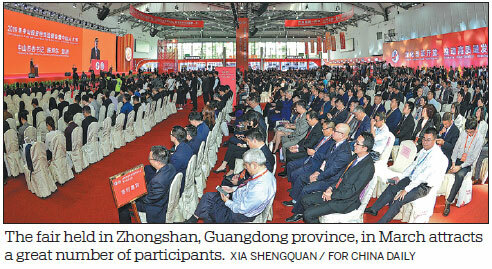 Chen Xudong, Party chief of Zhongshan, said the city is thirsty for professionals. "I firmly believe that professionals will be truly attracted by the platform, the innovation and the career that they could fully devote themselves to, rather than incentive policies," Chen said.